Kickstarter 4 developments here! This is a read-only forum. 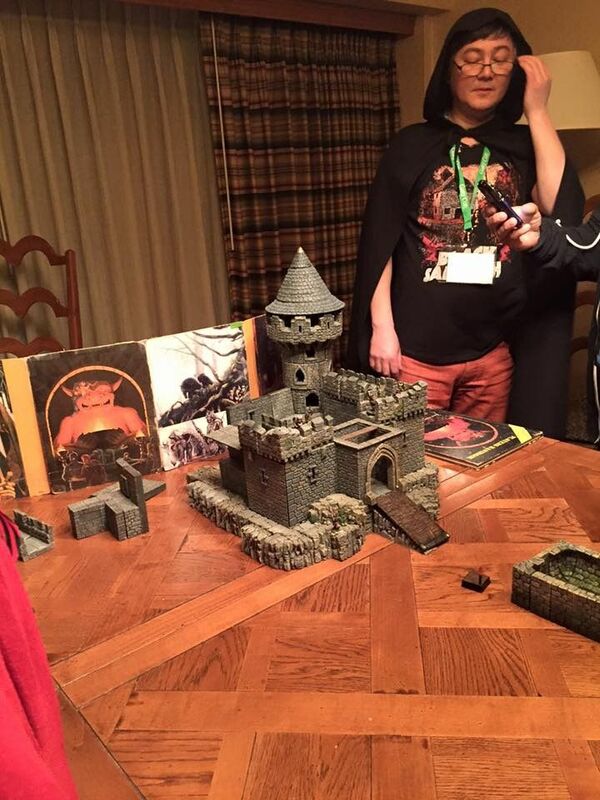 This build by Stefan at GaryCON, is based off of a CASTLE LEVEL base. Oldent wrote: I have a request. There was a very nice post on facebook from The Gary Con game. That is what I would like to build. 1. where people are concerned about the 'fit' on certain pieces based off what they see in the video. A- Here's how it works, for the other people who may not know: Kickstarter actually does fund the big, expensive steel molds. That means all those pieces in the video were not created from the currently non-existent molds (no time travel machines were used, either). So, that means everything is cast from molds created in-house. If you've ever done your own mold making and casting then you know when pouring for a single mold you have variances due to over-pouring and under-pouring. Plus, silicone molds just are not as precise as the huge steel molds. There are some prototypes that were done and sent back from the factory, but I don't recall which ones (based off pics I've seen), and am not going to look it up - sorry. 2. Can we request to see some CBS buildings inside the citadel so we can get a feeling for how big the citadel is? A- Nate added this to his photo list to shoot. 3. Will you consider making an Add-On only pledge level? A- currently in discussion. Jay is crunching numbers. 4. Why is the shipping on hand painted more than the shipping on the same item in dungeon grey? A- The shipping is more because EU pledges include all import fees (duties/VAT), and the value of the painted sets is higher. 1. I know they have to watch what they give away in SG's due to packaging and shipping but I really hope they provide some more base pieces in lieu of barrels, figures, et.al. A- A majority of the SGs will not be core pieces. But we think we have a lot of very useful and exciting SGs lined up. And no spider webs. 2. Would you pass on a request to make a base set of two Watchtowers and a Gatehouse for those of us that prefer the walls we already have? 4. With the different shipping for ROW, it seems add-on packs don't also enjoy that. A- Jays doing the best he can on shipping rates. 5. is it possible to substitute a CBS square tower for a castle corner? A- Yes, it will be forthcoming. We are still generating a large enough quantity of functioning prototypes to be able to demonstrate it. We will try and deliver hands on demo videos of as many of he pieces and pledges as possible. We know you guys are dying to see this stuff in action. 2. In the Watchtower graphic, it shows that each rounded wall is 6", does this mean that the watchtower floor circular piece is 12" (the graphic seems like it is much smaller)? A- Large towers are 6" in diameter. Small towers are 4" in diameter. Measurement in the name is diameter of the tower not the size of the actual piece. Sorry for the confusing name. SUGGESTION: a logical base pledge would be "The Wall". This would be 3 wall sections, pieces from the ruins (presuming they exist or just 2 x crenellation blocks) to use on each side, an assortment of mountain side pieces to lead up to it and decorate the surrounding area, 6 x crenellations/whatever. $175 dungeon gray + 1 x stretch goals This would be a perfect building set for someone who wants to create a very archetypal scenario of a ruined keep/building on a hill/mountain that adventurers run across. The stretch goals already compliment this extremely well. A- We've heard this loud and clear. 5. Why does the Tower have a curved stair SG instead of a straight stair? A- Because it's more modular for the tower. 1. Tell us about the pledge level and how they compare to previous 1/2/3/5/10 pledge levels. A- The pieces in these sets are really massive compared to previous KS campaigns and in an effort to keep entry points to a minimum price level DF needed to shift from a core set (2, 3, 5, 10) to a core build where the pieces are able to start you off at a specific table size. This also meant that Stretch Goals needed to be redevised as there were no sets, into the (1, 1, 2, 3, 4) levels. You will notice that that even our smaller builds (expect the single gatehouse) all get SGs. In the past entry points such at the Undercity and Overcity didn’t get SGs. This has been taken into account in this new model. 2. Are stretch goals working the same as previous kickstarters it looks like all pledge levels are getting the same? A- There are two pledge levels (Rampart and Watchtower) which receives 1x SG. Castle receives 2x SG, Citadel receives 3x SG, Grand Citadel receives 4x SG. The two lowest levels are to support different styles of builds as entry points to receive stretch goals. 3. What kind of free stretch goals can we expect beyond the two shown? A- The Stretch Goals will be smaller, intricate pieces that add character, add color and bring your castle even more to life. They will enhance the core build of each pledge level. 4. Can we get a Gorgon SG? A- That is a very interesting idea. 5. Will stretch goals continue at the 100K increments? A- Similar to the beginning of the KS3 campaign, the increments are a bit further apart during the initial rush of pledges. 6. Is this campaign EU shipping friendly? Will it be subject to VAT and Duty? A- Yes, DF will be paying the VAT and Duty for the following Countries: Canada, EU, Australia, and New Zealand. 7. Why do the pledge levels not have crenellations? A- The crenellations were a very popular add-on from KS3, and in an effort to keep prices low and not make individuals purchase duplicate pieces that they might not want or need, they were purposely moved out of the main pledge levels. KS3 crenellations are available in the DF store currently and there are more crenellation sculpts coming for those who might was different ones that were released previously. 8. Can I pledge to two different base pledges? (Ex a watchtower set in addition to the Grand citadel set.) How do I do this? A- Yes you can. All you do is add the amount of the extra Main Pledge to your total pledge. In this case, if painted, Watchtower and Grand Citadel would be $260 + $980 = $1,240. You only need to specify one Main pledge level when you use the KS checkout; we will capture all the selections (extra Main Pledges and Add-On Sets) using our pledge manager after the campaign has closed. The only important thing is to get the correct total pledge. Make sure to add any additional shipping as well.